When you think of sandbags, you probably think of heavy bags made of woven polypropylene or burlap that serve a single purpose: to block water. Though effective for preventing vast amounts of water damage, it's not so useful for the average person who has to deal with various situations on a smaller scale. Not anymore. Snake Sandbags™ is that other better solution. Not just for blocking water! Click here to read the FAQs. "Necessity is the mother of all invention." Albert Einstein's quote rings true! Snake Sandbags™ were created by a guy who never wanted to bail-out his girlfriend's parent's flooded garage ever again. After hauling hundreds of pounds of sandbags and a sore back every time a huge rainstorm was on the cusp, he saw the market provided no ideal solutions: a sandbag or equivalent that is lightweight, durable, easy to manage, and effective in diverting and blocking water. So, he set out to solve this problem himself. After much prototyping and testing, Snake Sandbags™ was born. Though Snake Sandbags™ were intended to be a functional product, the end result was better than expected. 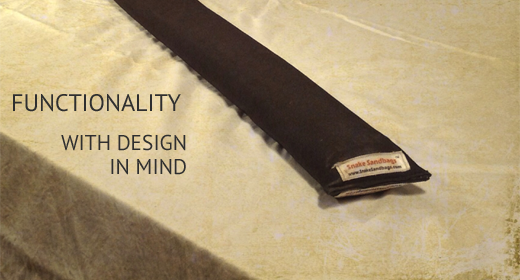 A simplistic design consisting of quality materials that stand up to the forces of nature. Elegance, Performance, Full Features. No Compromise. Regular sandbags can weigh up to 50 pounds. 6-foot Snake Sandbags™ can weigh 22 pounds. Do the math. Which one would you rather lift? Snake Sandbags™ are made out of CORDURA® nylon and are tear resistant. That's not true for your ordinary sandbags. Traditional sandbags are not only heavy, but also hard to carry. Snake Sandbags™ conforms to the average hand size. Have you ever tried bending traditional sandbags around a corner? Good luck. Build up by stacking Snake Sandbags™ in a pyramid fashion. For example, start with 3 on the bottom, 2 in the middle and 1 on top. Snake Sandbags™ are designed with a sealable inner liner to keep the sand dry (will vary based on usage). Need a custom size? Click here to contact us for more info! Available online at Amazon.com ! For international orders (outside United States), click here to contact us! For custom lengths or colors, click here to contact us and submit your request! SNAKE SANDBAGS LLC is located in and manufactures all Snake Sandbags™ in Indianapolis, Indiana, USA. Are Snake Sandbags™ available in various lengths? Yes. Standard Snake Sandbags™ are available in 3, 4, 5, and 6 foot lengths. Custom lengths are available. Click here to contact us for more info! What colors do Snake Sandbags™ come in? All Snake Sandbags™ sold on Amazon.com are available are Black. Custom colors, including Fluorescent Orange. are available directly from us. Click here to contact us for more info! Are Snake Sandbags™ mildew resistant? Yes. CORDURA™ nylon (the outer bag) is inherently mildew and rot resistant. If your Snake Sandbags™ are wet, let them air dry. Rotate them at regular intervals to ensure the whole sandbag dries. Yes. Snake Sandbags™ are tear-resistant. Why do Snake Sandbags™ have an Inner Liner? For three reasons: 1) To minimize the sand getting wet; 2) To be more effective at blocking water; and 3) To minimize dust from sand (If you ever dropped a bag of sand and you experienced a cloud of dust, you'll really appreciate never having to deal with that again). Will the sand in Snake Sandbags™ ever get wet? Though we cannot guarantee it, we have a pretty darn good process to seal the inner liner. We have performed numerous "100 hour submersion tests" with much success of keeping sand dry. Of course, performance will vary based on usage. We also have replacement inner liners available. How do you store Snake Sandbags™? Snake Sandbags™ should be laid flat in cool dry area when storing and can be stacked on top of each other. We do not recommend storing Snake Sandbags™ vertically. 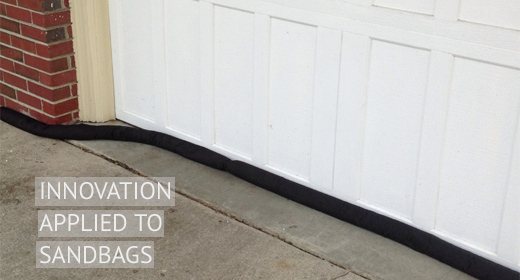 4-foot and longer Snake Sandbags™ can be folded in half to save space (see next question). How do I fold Snake Sandbags™ in half? This applies to all 4-foot and longer Snake Sandbags™ filled with the recommended level of sand. Grab the middle (center) of bag, lift and shake so the sand starts to fall to either side. Using both hands, continue by pinching opposite sides of the Snake Sandbag™ at the original location you grabbed. Shake as necessary to move the sand away from the location you are pinching. In no time, you will have created a fold. Voila! Your Snake Sandbag™ is now folded in half. You can also use Snake Sandbags™ in this configuration and even fold Snake Sandbags™ at different spots. The sand inside is not evenly distributed or there are spots where there is little or no sand at all. Why? This is normal. This often happens to Snake Sandbags™ that have been folded or held upright. 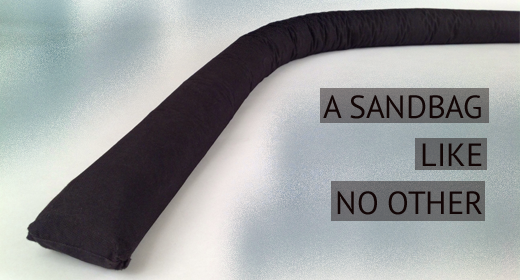 To evenly distribute the sand, grab one end of the Snake Sandbag™ and hold it vertically. If the sand does not start to fall due to gravity, with the heel of your other hand, strike the Snake Sandbag™ multiple times (not too hard) starting from middle and heading towards the top. Turn the Snake Sandbag™ upside down and repeat process as necessary. Stop when you feel the sand is distributed to your liking for your particular use. Are Snake Sandbags™ shipped with sand? No. Snake Sandbags™ are shipped as a self-fill kit. You will need to provide the sand. How much sand do I need to fill Snake Sandbags™? We recommend mason or playground sand that is dry. We DO NOT recommend using gravel. Where can I purchase sand? Sand is available at your local hardware store or nursey/garden center. What if I am not sure about how much sand to put in? Everyone uses Snake Sandbags™ differently. Some want more sand to be fuller or less sand to bend in various curves configurations. One way to test how much sand is right for you is to temporarily seal the inner liner with masking or painter's tape. This way you can add or remove sand without permanently sealing the inner liner. Just don't forget to use the bonding adhesives when you figured out the ideal amount of sand for your Snake Sandbags™. What else do I need other than sand? How big of a funnel do I need? Funnels that are used for changing oil for cars usually works well. If you use one of those, make sure there isn't any oil residue on the funnel before filling Snake Sandbags™. Any funnel with a narrow stem no larger than 2.5" in diameter will do. If you don't have a funnel or know it's not worth the trouble to get one, you can make something equivalent. Click here to check out some funnel hacks. What are traditional sandbags made of? Traditional sandbags are made of burlap, cotton, nylon, or the most known common material today, woven polypropolene. Do woven polypropolene sandbags really deteriorate in sunlight? Yes. Many manufacturers may UV coat the sandbags so they last longer, but eventually they will lose their strength and need to be replaced. How are traditional sandbags closed? Most sandbags are closed with either string, twine, cable ties, or steel loops. There are times when the tops are just folded over when the sandbags are stacked on top of each other. Where can I order Snake Sandbags™? In the USA, visit Amazon.com . For international orders (outside United States), click here to contact us. What forms of payment do you accept for international orders? We process international orders with Paypal and accept Visa, Mastercard, American Express, JCB, Discover, and Diners Club. Yes. Amazon is the trusted leader for online ordering, Paypal for international orders is also a trusted source for electronic payments. All over the world. If you are outside of the United States, click here to contact us to place an order! Just contact us! We'd love to talk to you about Snake Sandbags™, since we think they're really cool (we admit we are biased). Click here to contact us. Fill out the form below to let us know how we can help!